Crimefighter Spider-Man had already earned the wrath of would-be crime lord Green Goblin, but once the Goblin deduced Spidey's secret identity, all bets were off! Peter Parker found himself caught in a deadly game of cat-and-mouse with the father of his best friend, one who has no qualms about revealing Spider-Man's face to the world. This Spider-Man - in fact, this whole set - is based on Amazing Spider-Man #39. 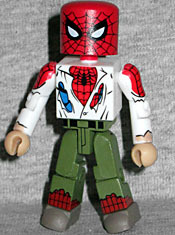 Spidey is wearing the tattered remnants of his street clothes, with his red and blue suit peeking out at the shoulders, chest and shins. He has a spider-mask that fits over his head, even though he wasn't wearing one like that on the cover. He does have hair to replace it, though. Scientist Norman Osborne was developing a formula that would enhance strength and intelligence, but when he exposed himself to the untested serum, he discovered its terrible side effect: madness! Super-strong and super-smart, the criminal mastermind called the Green Goblin is also super-dangerous. Osborn. Norman Osborn. 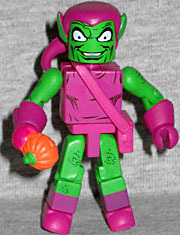 No E. This Green Goblin is not a substantial improvement over the one released in 2003. He definitely have better paint apps, detailing his muscles and some of the scales on his arms and legs, and a better face, but he has the same purse and and hat and is lacking the curly elf-shoes. On the plus side, he does have flared gloves now, so that's better. And his legs bend the right direction. The accessories are really where it's at, though. There's the Goblin-standard "pumpkin bomb" hand, but that's just the start. He also gets a second, human head and a hair piece with those traditional Osborn sideways-cornrows. Is this finally the long-missing "Unmasked Green Goblin" that was supposed to come out way back in that cancelled Target series? And then here's where it gets cool: he comes with his Goblin Glider, the classic bat-wing design with the flat face on the front. It has a footpeg on top and two ports in the bottom so it can attach to the included "exhaust plume" stand (a pale translucent orange). 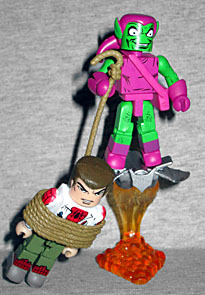 He also includes a length of rope, molded to fit around a standard Minimate torso and arms, allowing him to lasso Peter Parker and hoist him bodily into the sky. It's a nice display overall, with a lot of fun pieces. Oh, and Spider-Man gets a web line, too. We don't count Spider-Men the way we do Wolverines, but there are probably even more Spideys than there are Logans. Even so, none of them have ever been like this one, and that's special. Marvel Legends addendum: dat (medium-er) body.